Hungry Joe collected lists of fatal diseases and arranged them in alphabetical order so that he could put his finger without delay on any one he wanted to worry about. Read between the items, people, read between the items. Apparently there’s such a thing as a listicle (a listicle), but why?! What depraved mind came up with such a thing? Wikipedia says: “It is generally used in journalism to refer to short-form writing that uses a list as its thematic structure, but is fleshed out with sufficient verbiage to be published as an article.” Sufficient verbiage! A true list is only ever a list. It needs no verbiage. The last thing it wants to do is promote itself or sell you something. Here is one of my favourite lists. It is by the Finnish architect Eero Saarinen, writing about his wife’s attributes. Another favourite is a list “poem” by painter/playwright/poet Charles Green Shaw. It’s called “The Bohemian Dinner”. Charles Green Shaw, “The Bohemian Dinner” poem, undated. 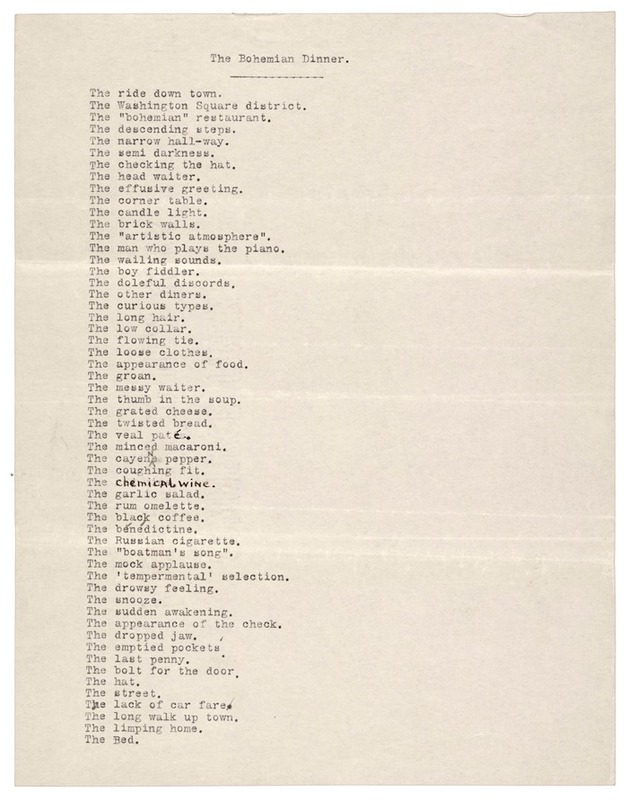 Charles Green Shaw papers, 1874–1979, Archives of American Art, Smithsonian Institution. I’ve tried out a few free list-making applications, like Teuxdeux, which bills itself as “simple” and “designy” and a successful collaboration between “swissmiss and Fictive Kin”, whatever they are, and comes loaded with endorsements such as “The Web’s Most Beautiful To-Do List” – a terrifying thought, that there could ever be one final, definitive list to which all others should aspire. Lists are not a beauty industry. And such applications are NEVER as satisfying as writing in a squishy notebook with a ballpoint. In Teudeux, when you delete an item, it actually disappears. It disappears. This destroys the thrill of looking upon the crossed-out item. Of gloating over it days, months, even years later. Here is another list. It’s by the German painter Adolf Konrad, from when he was planning a trip to Egypt and Italy in the sixties. Luckily he didn’t cross any of it out, though. The reason I’m thinking about lists is that I’m making a big one. It will be nowhere near as lovely as the lists above. It will be a simple compendium of things I probably need to do in order to get real about living in London. Some will be boring. For that, I can’t apologise. The whole point of the list is to reduce each item to its essence. It gets its colour from how it rubs up against other the list items. You could say that the act of writing it is plain old procrastination. Worse, that the list will subdue the spontaneity of daily life! Well, maybe. But the list has only as much power as you grant it. Don’t let it run riot. And don’t use highlighters, different-coloured markers, or fluorescent sticky notes. That way madness lies. 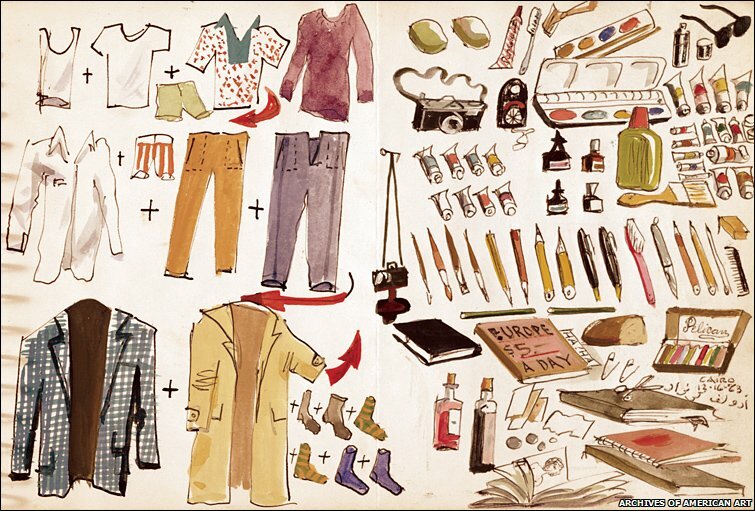 All of the list images here are from this tremendous book by Liza Kirwin called Lists: To-dos, Illustrated Inventories, Collected Thoughts, and Other Artists’ Enumerations (Princeton Architectural Press, 2008) from the Collections of the Smithsonian Museum. I am thrilled you are writing a blog Ash and I’ll be following! As a dedicated list maker I could really relate – earlier this year I bought myself 3(!) notebooks for my lists. 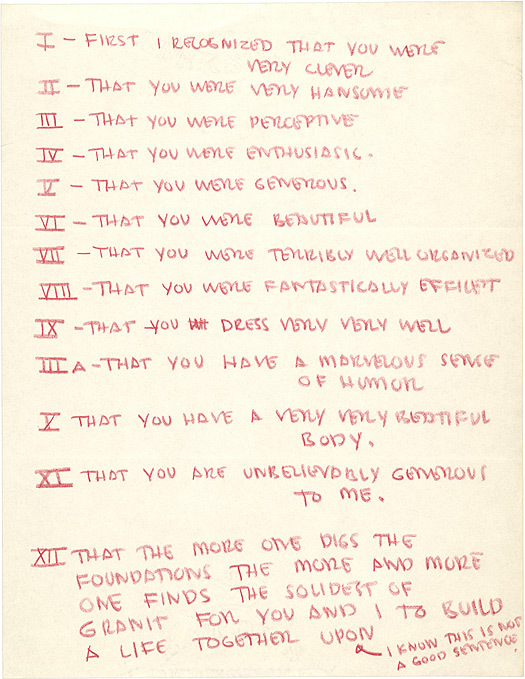 Loved Saarinen’s list – who knew they could be so beautiful.